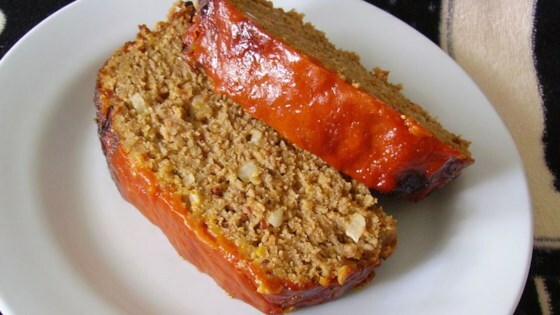 "My absolute fave meatloaf recipe!" Place bacon in a large skillet and cook over medium-high heat, turning occasionally, until evenly browned, about 10 minutes. Drain the bacon slices on paper towels. When cool, crumble into a large bowl. Mix ketchup and mustard in a bowl. Thoroughly combine 1/4 the ketchup mixture, ground chuck, Cheddar cheese, eggs, bread crumbs, mayonnaise, Worcestershire sauce, salt, and black pepper with crumbled bacon in bowl; pat the mixture into a 5x9-inch loaf pan. Spread remaining ketchup mixture evenly over top of meatloaf. Bake in the preheated oven until the meatloaf is no longer pink inside, about 45 minutes. Spread French-fried onions over the top of the loaf and return to oven until onions are browned and an instant-read meat thermometer inserted into the center of the loaf reads at least 160 degrees F (70 degrees C), 10 to 15 more minutes. Meatloaf in burger form with bacon - what's not to love? My family loved this , although I would not serve it every day. But as an occasional meal it is tasty and well received! It deserves five stars for flavor!